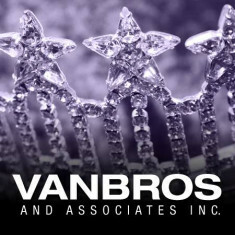 Vanbros became involved in the MISS USA & MISS TEEN USA pageants over 26 years ago. They began as the director for Kansas, and later became the director for Missouri, Oklahoma, Nebraska, Arkansas and Illinois. Vanbros has taken more than 150 women to the national MISS USA & MISS TEEN USA competitions. Under the Vanbros direction, our states have become regulars in the top-15 and top-5. There have even been six national winners. However, Vanbros is most proud of the 'post-pageant' real-life successes enjoyed by the titleholders and the contestants who write to thank us for their experience. You can read some of the testimonials at www.vanbros.com. The focus of Vanbros from the beginning, is for this program to provide a fair environment in which young women have the opportunity to better themselves. We hope the pageant encourages the contestants to gain self-awareness, self-confidence, individual pride, and greater social awareness. We hope each contestant improves her ability to communicate effectively, speak in front of people, and stand up for her beliefs. We encourage our contestants to find issues she feel's strongly about, and to become involved in organizations and causes that speak to her heart. Each young lady who enters this program has different goals, and we strive hard to assist each young woman in her own personal quest. Regardless of what your future career plans are, this is an environment that can open many exciting doors. Each year, career connections are made by contestants during their pageant experience! Or, maybe you have not decided yet on a future career path. That’s okay too because maybe this experience will help you find something you want to do with your life. This could even be your chance to get "discovered!" It’s happened to many young women before! We're especially proud of the fact that many contestants each year have never been in a pageant and they find it to be a rewarding and worthwhile experience. Many have won on their first attempt, and many others return because it was a positive experience. We like to believe that each young woman who participates in our pageant leaves a little more prepared to deal with the world around them, and more importantly, the world ahead of them! Basically, our philosophy for the MISS ARKANSAS USA & MISS ARKANSAS TEEN USA Pageant is not about encouraging young women to ‘win’ a pageant, but to encourage excellence in young women, and to help them develop life skills that will ultimately help them win in life by being the best they can be in everything they do. The winners of our State Pageant will each embark on an exciting journey, and receive a prize package including cash, wardrobe, and travel. While our program places an emphasis on excellence, achievement, and personal growth, we also strive to make the pageant experience FUN! The pageant is a two day event. On the first day, it's fun, fun, fun! The contestants enjoy getting to know the pageant staff and other contestants. The day is full of rehearsals. We bring in a choreographer and a producer, who will put together a great show. The day concludes with the Presentation Show. During the Presentation Show, each contestant is presented to the judges in the preliminary active wear/swimwear and evening gown competitions. The second day begins with the personal interview competition. During the interviews, each contestant has the opportunity to meet individually with each judge for a four minute interview. Each contestant has the opportunity to convince the judges she is right for the job of MISS ARKANSAS USA or MISS ARKANSAS TEEN USA. Following the interviews, the contestants return to the theater for more rehearsals. The second day ends with the Coronation Show. At the end of the final show, we will have a new MISS ARKANSAS USA & MISS ARKANSAS TEEN USA. 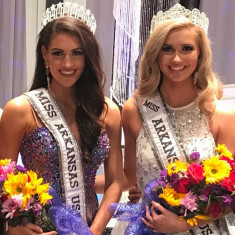 The winner of MISS ARKANSAS USA will advance to the nationally televised MISS USA Pageant, and the winner of the MISS ARKANSAS TEEN USA title will advance to the MISS TEEN USA Pageant. Should MISS ARKANSAS USA go on to win MISS USA, she would then advance to the ultimate contest... the internationally televised MISS UNIVERSE Pageant. Each Contestant will compete in three equal phases of preliminary competition: active wear/swimsuit, evening gown, and interview. The scores from the preliminary phases of competition are added up, and the contestants with the highest composite scores become semifinalists. The number of semifinalists will be between 10 and 15, and will be determined by the total number of contestants in the competition. Active Wear/Swimsuit: each contestant is evaluated on her physical fitness, stage-presence, and overall impression. Evening Gown: each contestant is evaluated on grace, poise, style, stage presence, the confidence with which she carries herself, and overall-impression. Interview: preliminary interviews are personal one-on-one style. You will have four minute interviews with each of the five judges. Its very comfortable and conversational. Contestants are scored on their communication skills, and personality. They are NOT scored on their opinions or personal beliefs. Once the semifinalists are announced during the final show, they will again compete in swimsuit and evening gown. These two phases of competition will narrow the field to a group of five finalists. The top-5 will then each have an on-stage interview. The interview will be conducted by the emcee. She will ask them a question submitted by a fellow contestant and one submitted by a judge. The interview will end with one randomly selected question unrelated to their bio, and submitted prior to the show by either the panel of judges or the contestants. After the top-5 interviews, the judges will make the final rankings based on their overall impression of each contestant. The judges will select a winner, 1st runner-up, 2nd runner-up, 3rd runner-up, and 4th runner-up in each age group. Private Interview: An outfit that represents your personality and you feel comfortable wearing. This can range from casual to business oriented, but something you would find in your own closet. Active Wear (TEEN): You will be competing in athletic wear as opposed to swimwear this year. You will need an athletic style sports bra and may chose between compression pants and compression shorts. You can select any color or pattern. Reflect your personality. No customized text (your name or title) is allowed. Wear coordinating tennis or gym shoes. Swimsuit (MISS): Miss contestants may chose between one and two-piece suits. However, adequate coverage is required and no thongs are allowed. Swimsuits may be any appropriate style, and design, and there are no color restrictions. Patterns and prints are also acceptable. Evening Gown: all contestants must have a full-length evening gown of their choice. The style, design, and color is up to you. It can be elaborate, or very simple. Choose something that makes you feel like Cinderella. Your gown should represent YOUR own personality and taste. Remember, you can look like a million bucks without spending a million bucks! Teens are encouraged to wear gowns that reflect a more youthful style and look than the Miss contestants. Fashion Show Opening Introductions: NEW! Beginning this year, we will no longer have an opening number dance routine. Each contestant will select an outfit of their choice to wear in a runway style FASHION SHOW INTRODUCTION. Select an outfit that reflects your own personality, style and sense of fashion. You can select a dress, pants, shorts, jumpsuit/romper of any color or print with coordinating footwear and any accessories (NO FULL LENGTH GOWNS or FLOOR LENGTH TRAINS). Please make sure your outfit is in good taste! Have fun and show your personality! You may select a fashion show opening outfit that can also be worn during your private interview (refer to the private interview information above). After reviewing all of the information on our Web site, if you have an interest in becoming a contestant, click on "Apply Today" above and follow the easy steps. There is NO fee required to apply. Once we receive your application, it will be reviewed by a selection committee. If your application is approved, you’ll be contacted by the pageant office. Miss Arkansas USA & Teen USA is the official preliminary to the Miss USA & Miss Teen USA pageants. The winner of Miss Arkansas USA & competes at the Miss USA pageant, representing Arkansas, for a chance to win the title of Miss USA and further go on to compete at Miss Universe. Miss Arkansas USA has four phases of competition that include: private interview, on-stage question, evening gown and swimsuit. In order to compete for Miss Arkansas USA you must be at least 18 years old and under 28 years of age before January 1st in the year they hope to compete in the Miss USA pageant and you need to have won a preliminary title. 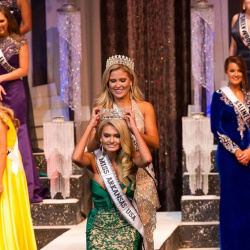 The winner of Miss Arkansas Teen USA competes at the Miss Teen USA pageant, representing Arkansas, for a chance to win the title of Miss Teen USA. Miss Arkansas Teen USA has four phases of competition that include: private interview, on-stage question, evening gown and athletic wear. In order to compete for Miss Arkansas Teen USA you must be at least 14 years old and under 19 years of age before January 1st in the year they hope to compete in the Miss Teen USA pageant and you need to have won a preliminary title.